Over the past few weeks in my newsletter, “On The Mark,” I discussed some things that generally occur at major stock market tops. Here is a brief synopsis. 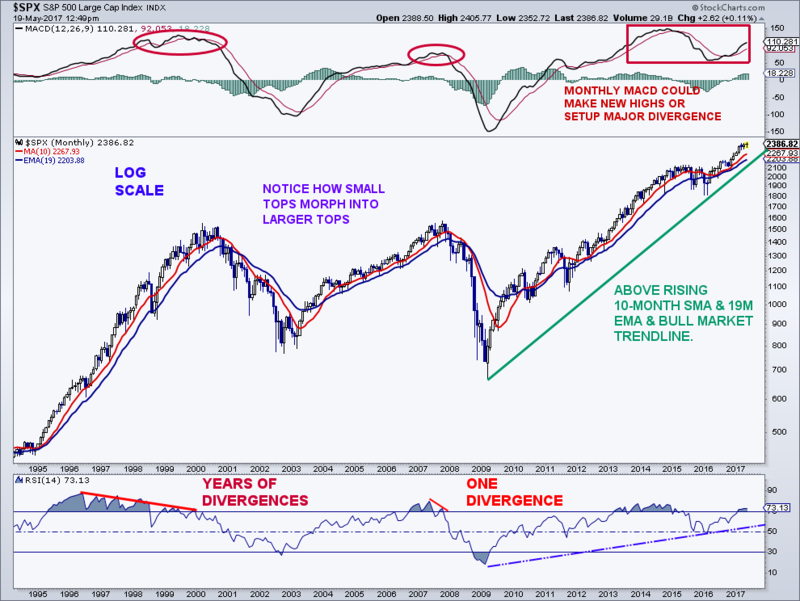 Major stock market tops are generally accompanied by lengthy divergences with respect to market internals and longer-term (weekly, monthly) momentum as well as extreme optimism from a sentiment standpoint. 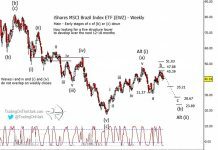 Sometimes, extreme speculation toward one area of the market (remember the biotechs, the housing and financial stocks, the dotcoms and technology stocks, the consumer staple stocks, and the nifty fifty, etc.). Where is that sector right now? I really do not think we have one at this point. We certainly do not have the ingredients for a major market top when looking at market internals. The common stock-only advance-decline (A/D) line as well as the more traditional A/D line are both hitting new ATHs as we speak. The last couple of peaks in the A/D line were in 1998, mid-2007, and mid-2015. 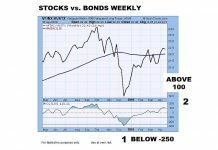 The last two were months before the S&P 500 Index (INDEXSP:.INX) peaked, while the ’98 peak was years before the market peaked. Longer-term momentum does present some issues, as this new high in the S&P 500 has not been confirmed by a new high in monthly momentum. This is certainly something to keep an eye on over the coming months, but right now, it is not a problem as new monthly momentum highs are still a possibility. 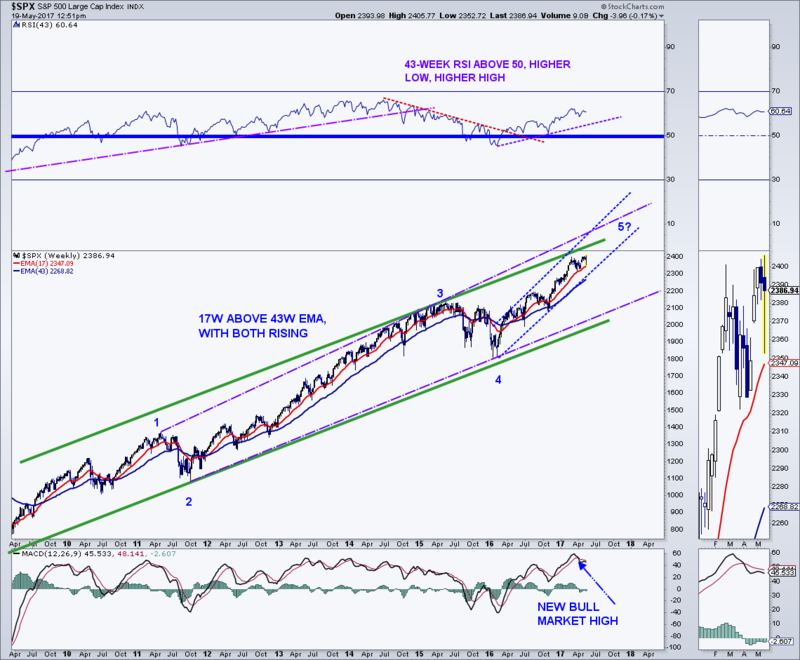 On a weekly basis, MACD recently made a new bull market high with the 14W RSI almost making a new bull high. This is not a sign of a major top as at least one bearish divergence, if not many, are seen before the final price high. 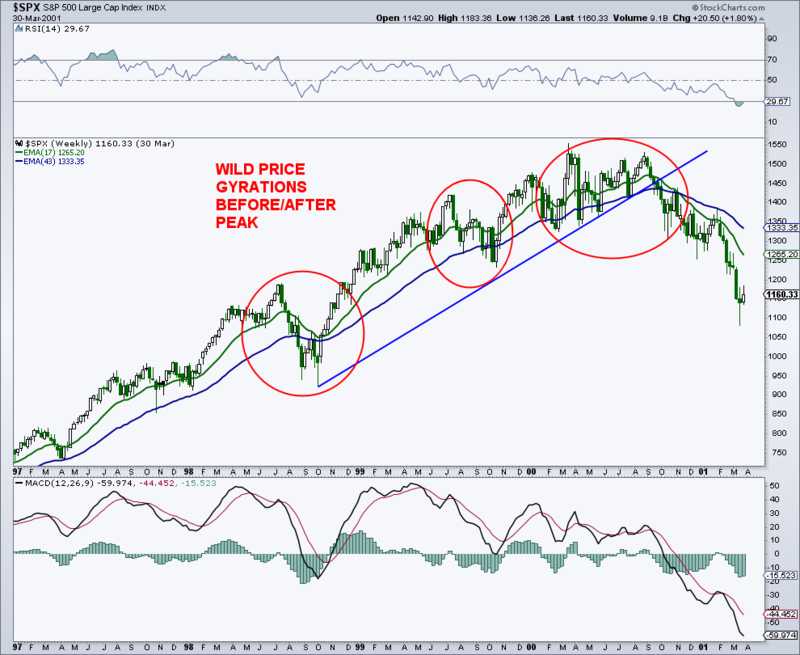 One key ingredient to a major market peak is a pick up in price volatility. As my title goes, markets don’t peak when price action is extremely calm. There are multiple warnings from a volatility perspective during major peaks and we certainly are not seeing anything remotely close right now. Looking at the last two major stock market tops bears this out, pun intended. The 2000 stock market peak, which was a secular market peak, saw plenty of pickup in volatility both prior to the high and after it. There was a very short major correction/bear market (20%+) in 1998, which was a very early warning sign that a top was coming. From July to October 1999, the S&P 500 fell 13%, but then rallied almost 20% into early January 2000. This was followed by a 10% pullback over the next two months and then a 17% rally into the March 2000 peak. That’s volatility! 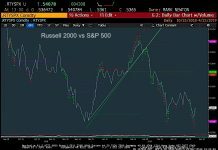 Following the March 2000 peak, the “500” then fell almost 14% in a month, which then led to a 14% rally into August 2000. This was followed by an almost 15% decline into October 2000. 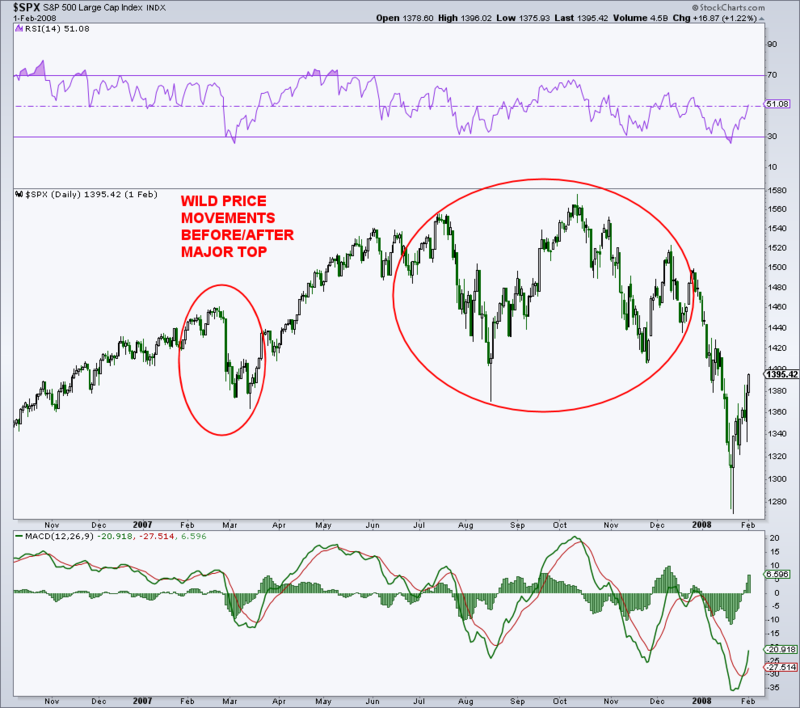 The same thing can be seen during the 2007/2008-market peak which was a cyclical top. There was an early warning sign in the beginning of 2007 with the S&P 500 falling 6.7% from February 22 to March 14. The initial peak occurred in July 2007 and that was followed by an almost 12% decline into August. The “500” then soared 15% into the October 2007 market top. This was then followed by an 11% dip into the end of November and then an 8% rally into December. Clearly, the market is not showing this kind of evidence of a top. The only thing that can be said is that the volatility seen in 2015/2016 may be the early warning signs of a top that we saw in 1998 and early 2007. Another type of major stock market top can also be seen, but is pretty rare, and that is a parabolic top or asymptotic top. This top was certainly seen in 1929 and to a lesser degree, in 1987. We also saw this type of top with the Nasdaq Composite from 1998 until early 2000. These peaks can also be called Christmas trees because that’s what they look like after they are complete and when most/all of the gains have disappeared. We certainly do not have this price action now either. 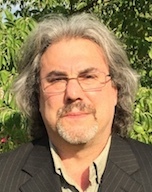 Feel free to reach out to me at arbetermark@gmail.com for inquiries about my newsletter “On The Mark”.